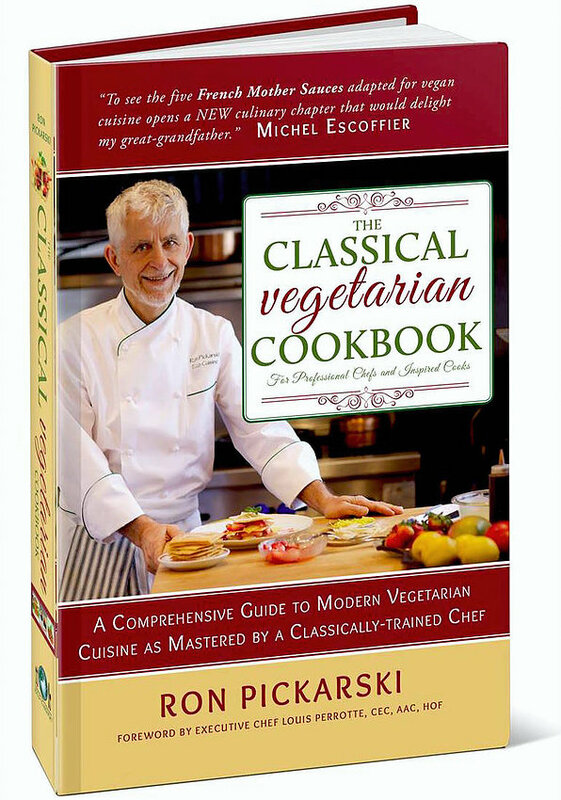 The Classical Vegetarian Cookbook For Professional Chefs and Inspired Cooks, Pon Pickarski (2015) - Vegans Eat What? Vegans Eat What? Full disclosure, we love Ron Pickarski! From the first time we experienced his cooking at a national vegetarian conference held at Regis University in 1991 in Denver, Colorado, we knew that he was the “real deal”. Not only is he an amazing chef, he is truly accessible and the nicest and most interesting person you’d ever want to meet! Certainly we know the Escoffier family name as would any “foodie”. Even so, not being classically trained as is Chef Pickarski, the words “five French Mother Sauces” sent my mind spinning! I couldn’t wait to open this book and learn more! Note that Chef Ron has more than earned his reputation – the hard way. He is the Founder/Director of the American Natural Foods Team which competed at the quadrennial International Culinary Olympics (IKO) in Germany. Between 1980 and 1996 he won seven medals (gold, silver, and bronze) with only plant-based vegan/vegetarian foods and was the first chef in the history of that prestigious event to do so. Mind you, at that time most of these events did not even have a vegetarian category, much less vegan category. Whatever your skill level or understanding of vegan cuisine, this cookbook has comprehensive basic information on vegan protein, nutrition, ingredients, cooking techniques and innovative recipes you can relate to at your skill level. Ron lays the culinary foundation for each inspired culinarian to build on at their level of competency. One could have no understanding of vegan cuisine, read this cookbook from page to page and be able to competently cook vegan cuisine at a basic level. There are recipes as simple as ice cream in a blender. We look forward to him teaching a vegan certification program at a regional cooking school in the near future. For now, focused application of his teachings in this cookbook will provide you with an “at home” cooking school. This is Chef Pickarski’s 4th cookbook (all winners, in our estimation), and we know that you will love it! It contains more than 400 recipes with over 1200 options! For now, you can get this cookbook at a greatly discounted price (40% discount) from his website www.eco-cuisine.com. You’ll note that his company, Eco-cuisine, offers high quality, low cost plant based protein, broth, bakery, and pudding mixes for foodservice and retail use. He’s been developing these for years and has revolutionized the food industry by providing professional and large organizations with low cost, easy to use mixes for a variety of vegan based food items. Check it out – you’ll be amazed! The recipes that we tried included Southern Blackened Tempeh with Tomato-Apricot-Ginger Coulis, Szekely Goulash, Cajun Gumbo, Pistachio Polenta, Sauce Renaissance, Mushroom Sauce, Basic Tofu Pate, Pate Francais, and Sea Vegetable Cakes. Below is one of our favorites from his book, Szekely Goulash. Enjoy! Sauté the onions and seitan in oil along with the soup base, salt and paprika over medium heat, stirring, for about 5 minutes. Add the sauerkraut, sour cream and Soy Milk Sauce, mix in well. Continue to stir the mixture over medium heat. If the mixture becomes too thick, add just enough water to thin it to a sauce consistency (one that will coat the back of a spoon to about 1/16 inch or so. Serve hot, over noodles, with a vegetable side dish. Heat the oil in a small saucepan until it is hot but not smoking. Add the flour and stir constantly to prevent burning. Cook this roux for 3 to 5 minutes. In a separate pan, heat the soy milk. Add the hot milk slowly to the roux and whip it vigorously to make a smooth sauce. When all the milk is added and the sauce thickens, cook for a few more minutes. Tofu Cashew Sour Cream – p 175 – makes 1 cup. Time: 10 minutes prep and 24 hours wait. Place the cashews in a blender, and blend into a fine meal. Add the remaining ingredients, and blend until the mixture is smooth and creamy. Transfer the mixture to a covered container. Refrigerate for 24 hours to incubate. Note: Chef Ron’s book offers options and variations (for example, for the Béchamel Sauce rather than Soy Milk Sauce and options for the Sour Cream including Cauliflower Sour Cream) making it one cookbook that everyone, vegan or not, should own and use regularly!